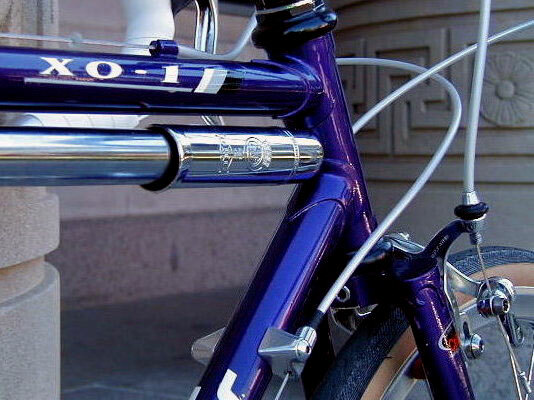 The XO-1 has become *the* iconic bicycle from Bridgestone and over the years has developed a near cult following. Although the orange '93 XO-1 seems to get more attention, I prefer the original '92, both for it's long reach caliper brakes and metallic purple paint. 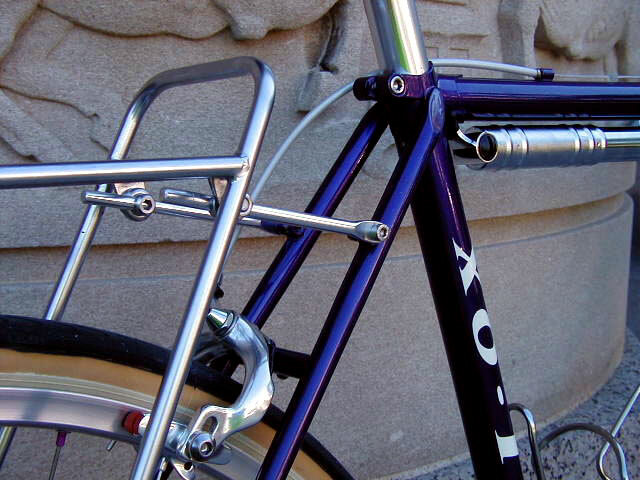 I purchased this frame several years ago with the intention of building it into an S&S coupled travel bike. Endless hours of scouring the 'net yielded an assortment of premo NOS and modern parts to build it up. But by the time I had collected the parts, I found my need for a travel bike had evaporated and the frame just hung there. Last fall a friend asked me to keep an eye peeled for a good all-rounder style bicycle for her and a week later I was shooting the photos you see below. So this bike is actually "Sally H's XO-1". The design goal in this build is to produce a machine that's stable, easy to ride and low maintainance / durable, mainly for faster, unladened road riding, but retaining the jack-of-all-trades "go anywhere" capabilities of the original XO-1. The geometry of the XO-1 is perfect for this goal, as it's basically a 26" wheeled sport-touring geometry. The styling is very classic, with lots of shiney polished silver alloy bits and zero black components. The drivetrain is an ultra-wide double, which avoids the weigh and complexity of a triple, but still offers a low enough gear for credit card touring in the mountains or light off-roading. The current tires are 1.25" wide, but there's clearance for much wider rubber (1.9" according to the '92 Bridgestone catalog). 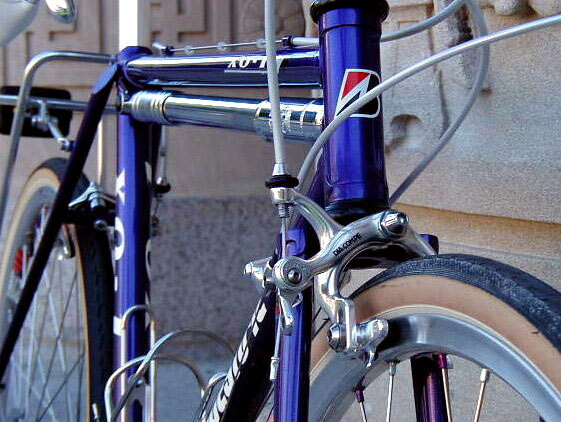 Both the brake calipers and brake levers incorporate quick releases, to better accommodate such wider tires or knobbies. 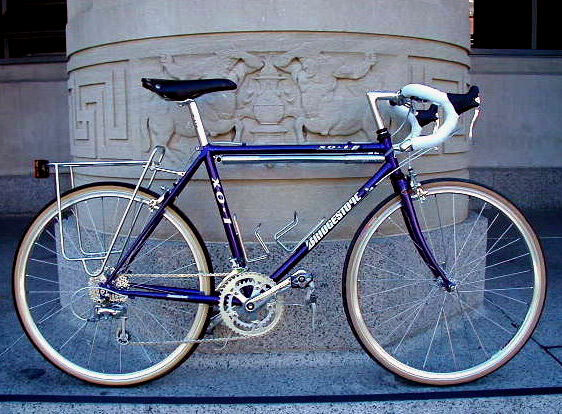 The build is as follows.... FRAME: 1992 Bridgestone XO-1 in remarkably good condition, built with quad butted Ishiwata Cro-Mo tubing, brazed/lugged construction, CRANK: NOS mid-90's XT with 46/34 chainrings (no granny ring), BB: XT sealed cartridge, CHAIN: Sram PC-69, CASSETTE: 9 speed XT M760 11/32, RD: Ultegra long cage (careful adjustment of the B-tension allows this to shift the 11/32 cassette *perfectly*), FD: Ultegra double, WHEELS: Shimano 105 hubs + Campy Mirox rims (polished & beautiful!) 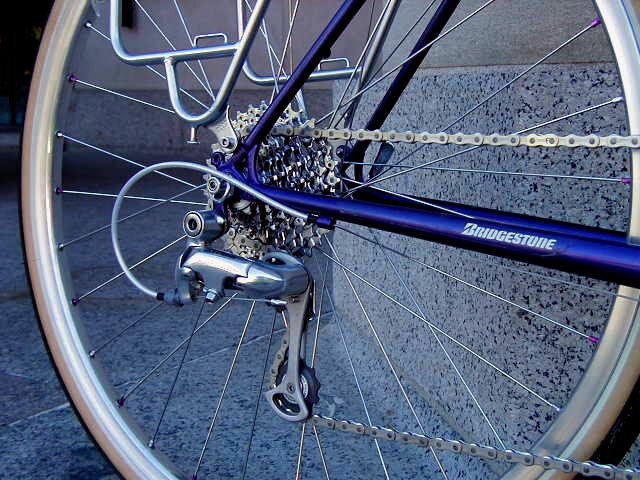 + butted stainless spokes of unknown provenance, SKEWERS: Dura-Ace, TIRES: Panaracer 1.25" Pasela, SEATPOST: Shimano XTR, CALIPERS: Dia-Compe BRS-300 long reach calipers + Kool-Stop shoes with Salmon inserts, BRAKE LEVERS: Cane Creek SCR-5C "short reach" + Tektro "interruptor" levers on the bar top, STEM: Nitto Technomic Deluxe, HANDLEBARS: NOS Modolo Q-Even Compact (short reach/shallow drop), BAR TAPE: generic syntho-cork, RACK: Nitto Campee, BOTTLE CAGES: hand polished tubular stainless, PUMP: Silca Impero, GIANT PILLAR/PHOTGRAPHIC PROP: University of Michigan Museum of Art entrance. Saddle and pedals in the photographs are a San Marco Regal and Suntour Superbe -- they were only installed for a test ride though.